Enter to win Game of Thrones Season 6 on Bluray! Mind on Movies is very excited to announce that we are working with the upcoming Blu-ray release, Games of Thrones Season 6. 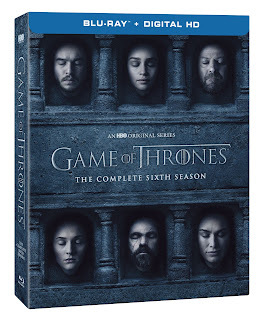 The Emmy® Award-winning HBO® series Game of Thrones is known for many things: shocking deaths, breathtaking special effects and, when it comes to DVD releases, extensive and captivating bonus content. To celebrate the November 15 release of Game of Thrones: The Complete Sixth Season on Blu-ray™ and DVD, HBO is bringing the box set’s exclusive bonus features to life in three groundbreaking events with interactive experiences including photo, video and virtual reality that take fans behind the scenes and immerse them into the world of Game of Thrones. Own Game of Thrones on Bluray and DVD on November 15th! a Rafflecopter giveaway Disclaimer: Only one entry per mailing address per giveaway. The prize will be sent via FedEx or UPS. No P.O. Boxes please. This contest is from Mind on Movies working with HBO. The entries will be checked. You must do what it says on the widget option to enter to win.